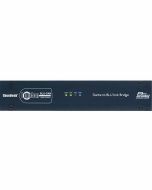 The Soundweb London BLU-101 Series Conferencing Processer offers a fixed configuration of up to 12 analog inputs and 8 analog outputs, configurable signal processing, AEC (acoustic echo cancellation) processing, and a high bandwidth, fault tolerant digital audio bus. Also available with a telephone input (BLU-102) or VoIP input (BLU-103). All units have open architecture which is fully configurable through HiQnet London Architect. A rich palette of processing and logic objects and a "drag and drop" method of configuration provide a simple and familiar design environment. 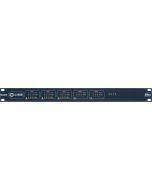 This processor features a low latency, fault tolerant digital audio bus of 48 channels which uses standard Category 5e cabling giving a distance of 100m between compatible devices. 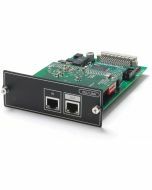 Fiber media converters can be used to increase the distance between devices to over 40km. The AEC algorithm can be applied to signals coming from the local analog inputs or from the digital audio bus. Up to 12 individual AEC references (one per algorithm) allow the user to provide a solution for multiple conferencing spaces using a single device. Automatic Gain Control (AGC) and Noise Cancellation (NC) are also provided per AEC algorithm. AGC ensures that microphone levels remain at an optimum level, and NC removes steady state noise (such as from a projector fan or air conditioning device) from the signal path. 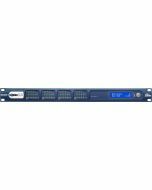 Compatible with the entire Soundweb London family, the 48 channel digital audio bus represents channels 1-48 of the larger 256 channel digital audio bus when integrated with the BLU-800, BLU-320, BLU-160, BLU-120, BLU-BIB and BLU-BOB devices. 12 Control Inputs and 6 Logic Outputs allow integration with GPIO compatible devices.